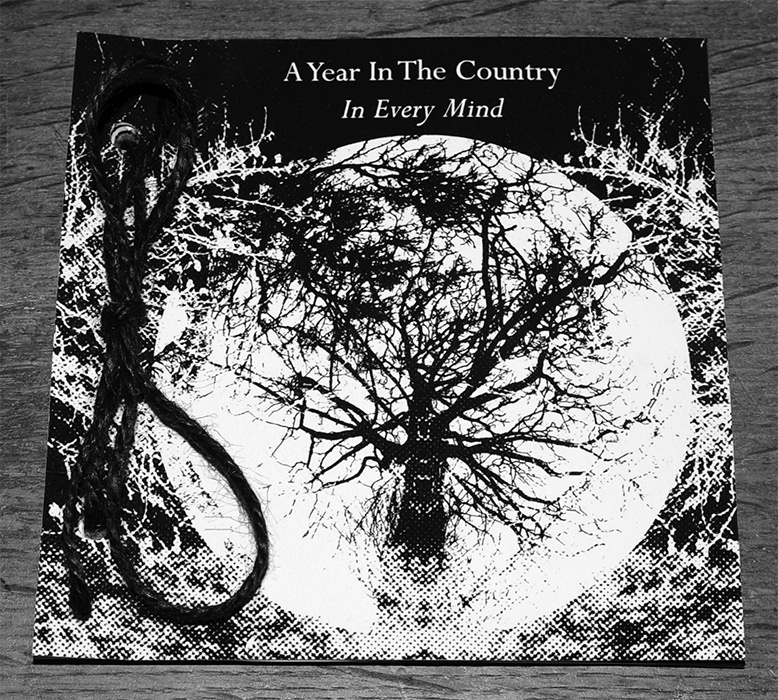 A Year In The Country: In Every Mind. 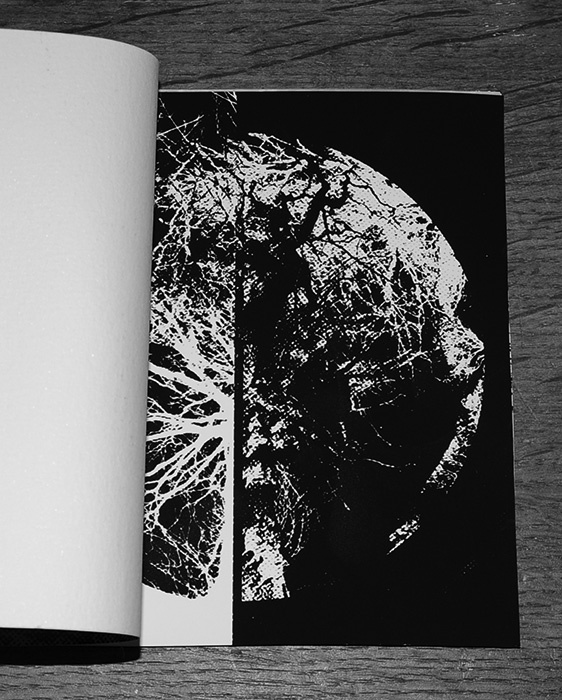 Transmission Resonances: Volume 1. 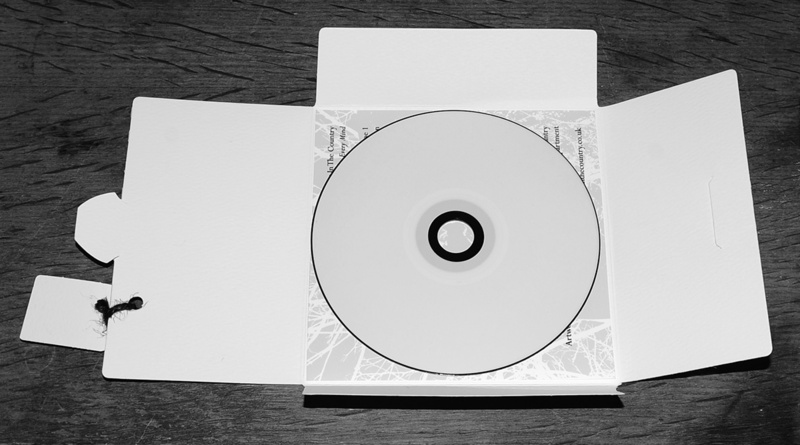 CD album. 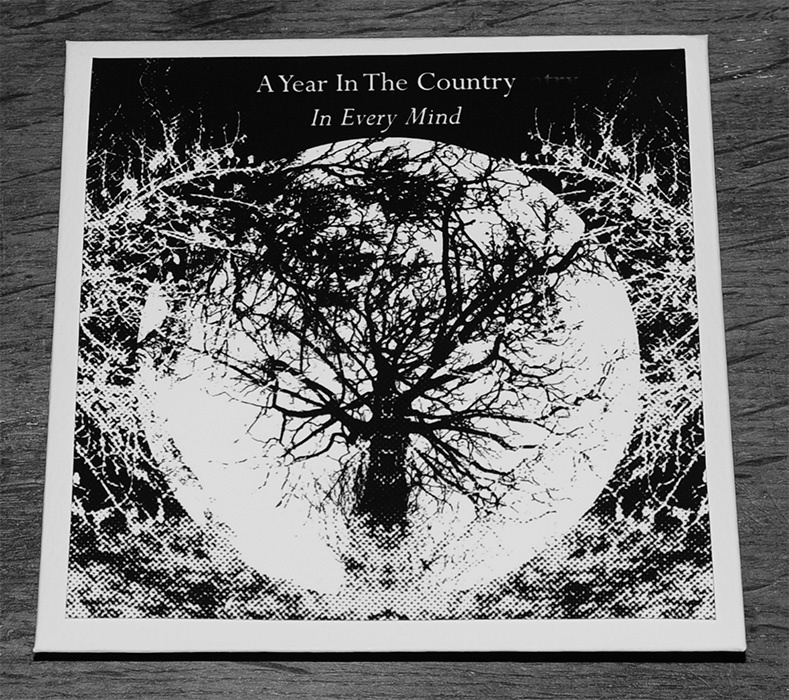 A Year In The Country: In Every Mind CD album. Night Edition £25.00. Dawn edition £13.00. 12 audiological pathways. 46 minutes. Audiological pathways: Eternal Strigiformes, Escapees, It Doth Blow, Scrabble and Abrade, In Every Mind, Tick Tock, Light Catching, The Journey, Perceive, The Need To Live, The Music Box, An Idyll. 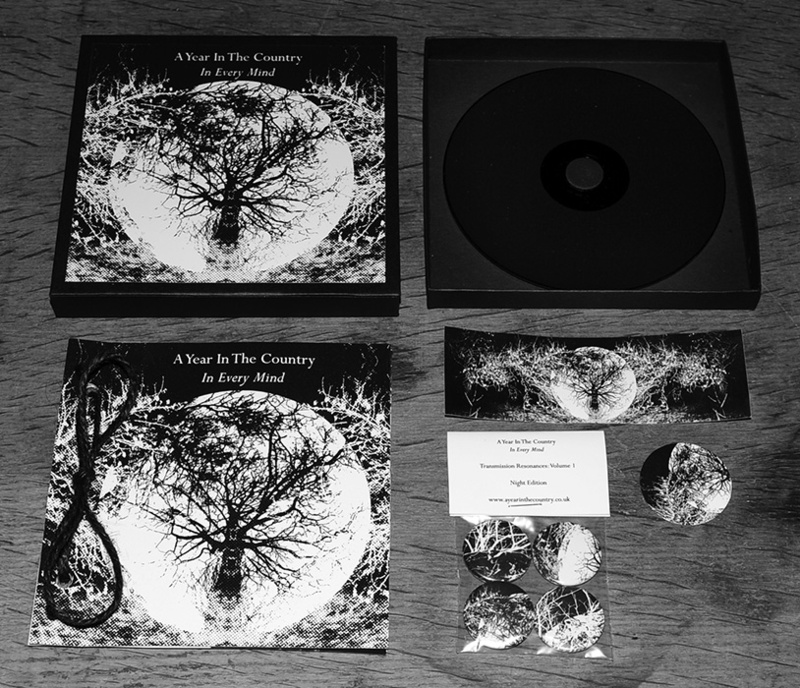 Available via our: Artifacts Shop, Discogs Audiological Archive and our Bandcamp Ether Victrola. Prices include free UK shipping. Normally ships within 7-14 days. Custom printed and hand-finished by A Year In The Country. A Year In The Country. In contrast to the telling of tales from the wald/wild wood in times gone by, today the stories that have become our cultural folklore we discover, treasure, pass down, are informed and inspired by, are often those that are transmitted into the world via the airwaves, the (once) cathode ray machine in the corner of the room, the zeros and ones that flitter around the world and the flickers of (once) celluloid tales. They take root in our minds and imagination via the darkened rooms of modern-day reverie, partaken of in communal or solitary seance. 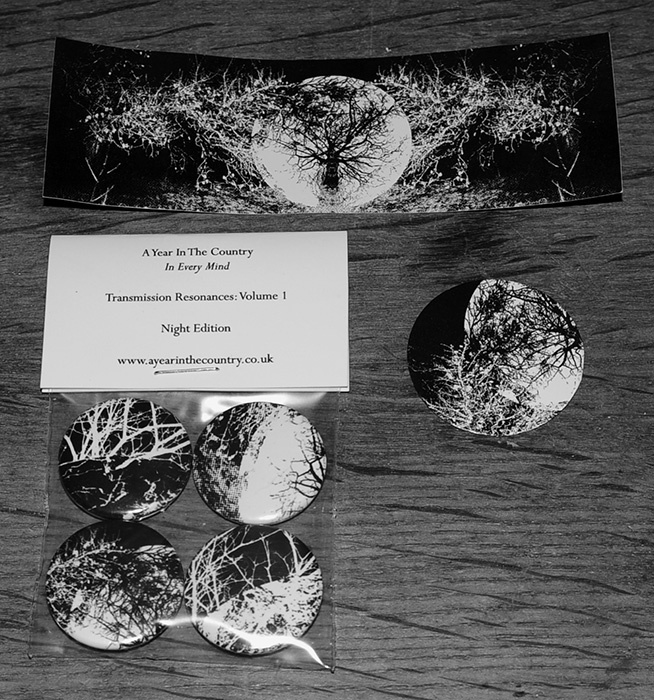 The Transmission Resonances volumes of audiological constructs will take as their wellspring such stories; focusing on those tales that continue to resonate over time, which have gained layers of meaning as the years have passed, that express and/or explore some sense of otherly pastoralism and which skirt the edgelands. From that first fount, the plan is for these volumes to wander through their own particular journey, pushing aside the brambles and travelling the pathways that they will; to consider the stories of the patterns beneath the plough and the pylons across the land. 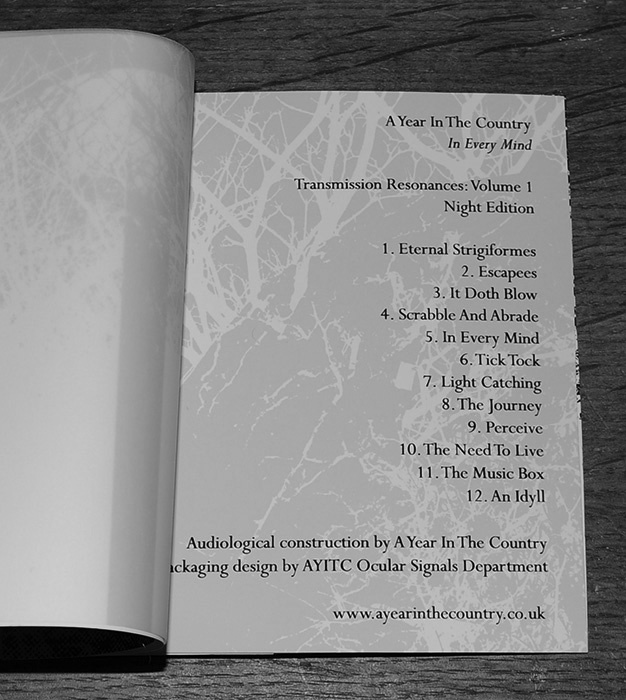 Transmission Resonances: Volume 1 takes as its wellhead the continuing reverberations of the 1969 cathode ray version of Alan Garner’s The Owl Service. It pushes open the attic door from whence the scratching descends and travels to places that surprised, intrigued and even delighted our good selves when it was being shaped on our own particular audiological potters wheels. Front of CDr. Underneath of CDr. 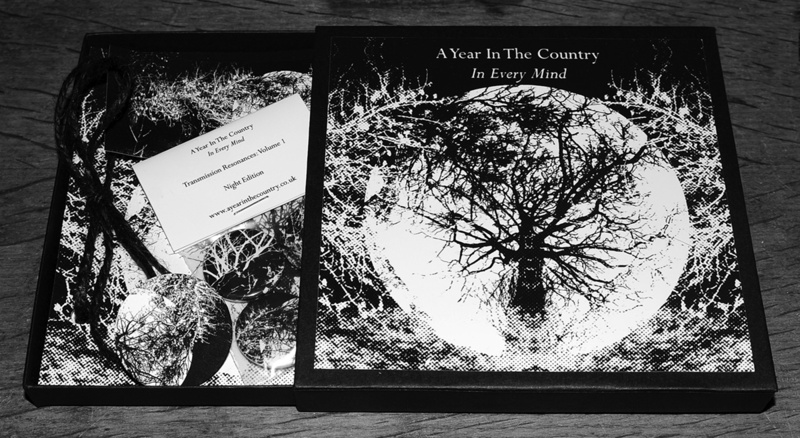 1) Booklet/cover art custom printed by A Year In The Country using archival Giclée pigment ink. 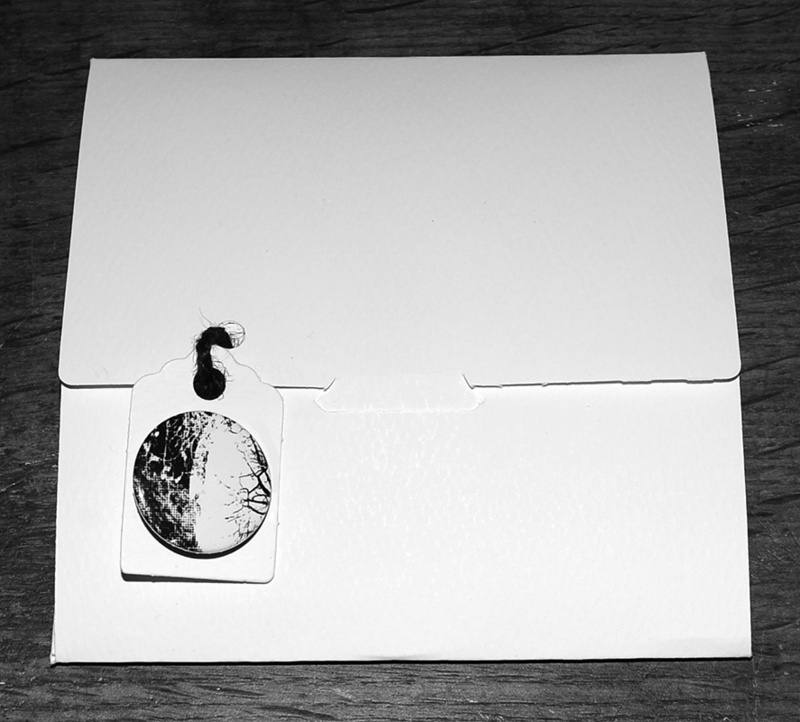 2) Contained in a matchbox style sliding two-part rigid matt card box. 3) Printed box cover print. 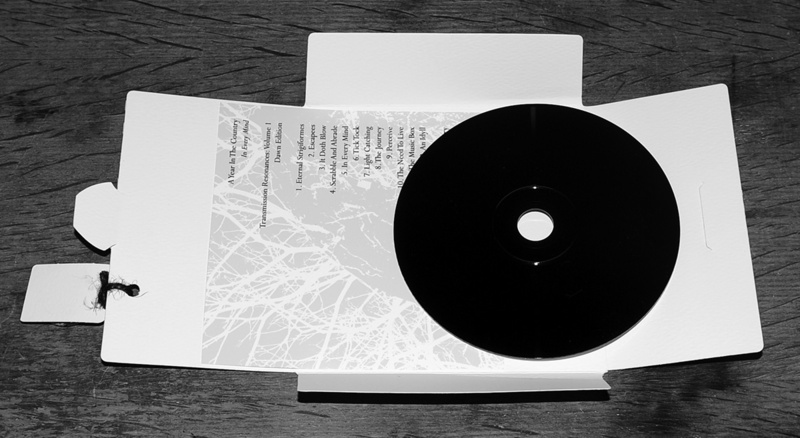 4) Fully black CDr (black on top, black on playable side). 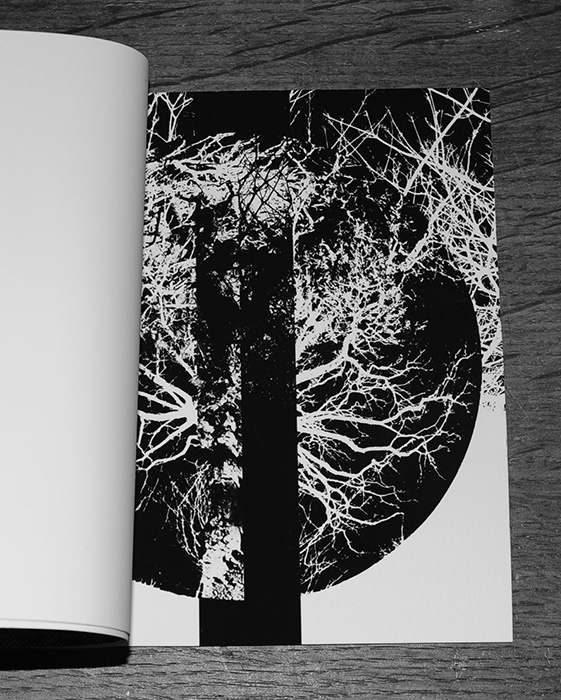 Printed on 310gsm textured fine art cotton rag paper, 245gsm card and semi-transparent 110gsm vellum paper. 6) 4 x 25mm badges in a see-through polythene bag with a folded card header. 7) 11.8cm x 4cm and 3.5cm circular vinyl style stickers. Dawn Edition. Limited to 52 copies. £13.00. 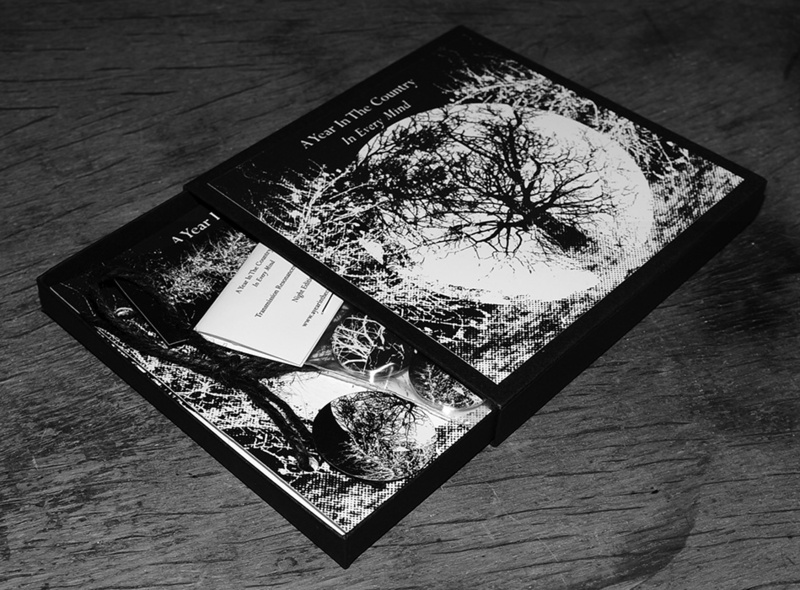 Hand-finished white/black CDr album in textured recycled fold out sleeve with insert and badge. Top of CDr. Underneath of CDr. Artwork custom printed by A Year In The Country using archival Giclée pigment ink. Includes 25mm/1″ badge, secured with removable glue on a tag which is string bound to the sleeve. Back of the insert is hand signed. Audiological construction by A Year In The Country. Artwork and packaging design by AYITC Ocular Signals Department.